Members of the Karen Community, who in many cases are new to Victoria, love the simple art of fishing. For Fisheries Victoria, getting the best information to this new community to help with promotion of good fishing practice, was a bit of a tricky task. “Fisheries officers in the field were telling us that they were starting to see people from this community being very active, and also having to speak to them about non-compliance in a few areas” Anne McLaughlin an Education Officer for Fisheries Victoria said. 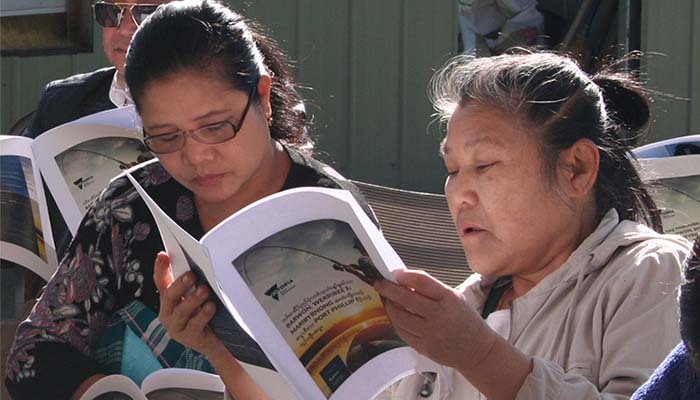 The Karen people are from Burma and are a growing group in Victoria. Many are from refugee backgrounds and have different levels of English proficiency. “We spent a bit of time speaking to members of the community and giving them a range of information, but it was missing the mark. We definitely saw a gap in needing a new resource in their language.” Anne said. Fisheries Victoria is a branch of the Victorian Department of Economic Development, Jobs, and Transport & Resources and is responsible for a range of regulation around fishing and aquaculture. Anne had already had some contact with the Centre for Culture Ethnicity and Health and thought they would be an effective partner in making scientific and regulatory information simple and meaningful to a community where members may have a range of skills in terms of literacy. “We knew the CEH had experience in a range of different communities and we had seen some work they had done around problem gambling and thought they really understood nuances and subtleties of the communities they work with,” She said. “We decided to run a number of focus groups, facilitated by the CEH, with the Karen Community,” Anne said. “The conversations we had with the community really helped hone the information we were providing and ensured that the resource we were going to create was user-friendly and helpful. This meant we ended up with a much more streamlined brochure than we first thought.”. With this new knowledge Fisheries were able to create simple and concise guide that reflected the needs of the community and CEH facilitated this process by using their cultural competence and expertise to monitor the design and translation process. The guide printed by Fisheries Victoria had an initial run of 10,000 copies and was distributed amongst the Karen community. “The information we have, will have a long lifespan for us so it is good to see we will be using this guide for some time.” Anne said. Anne spoke about some of the good outcomes of the project being seeing people from the community so pleased to have input into the project and that it will also give members from that community a lot more confidence when they are fishing in Victoria.“Working with the CEH was a really good experience,” She said. “I felt the process was uncomplicated and clear and I think we feel much more self-assured when working with new communities now.”.